HELIX Packaging Systems Pty Ltd, an Australian-owned company established as Helix Electrical Products in 1938, is now located in Carlton, Sydney. The company provides packaging machinery and consumables with consultancy to small to medium sized businesses requiring well designed and manufactured machines at reasonable prices. The packaging machines available include: Bag Sealers, Continuous Band Sealers, L Bar, Shrink Lines, both forms of Flow Wrappers, Vacuum (MAP) systems, Form Fill and Seal, Pouch Packers, Net and Multi Head weighers, Fillers, tray/tub Lidding Sealers - manual, semi automatic and fully automatic in-line and rotary with or without MAP, Ultrasonic heavy duty plastic sealers and Spiral Wrappers. 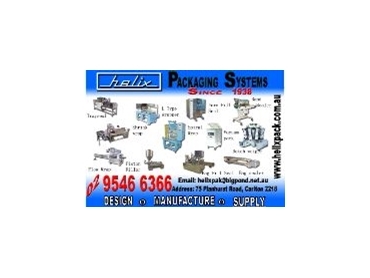 Most products will be on display at the Helix Packaging Systems Pty Ltd stand at Auspack 2005.